Molly Makes Hollywood Happen and Justice Prevails! Folks, it’s been exactly three and a half months since my post, EWS Kids Sign with Major Hollywood Agencies, and it’s already time for an update. 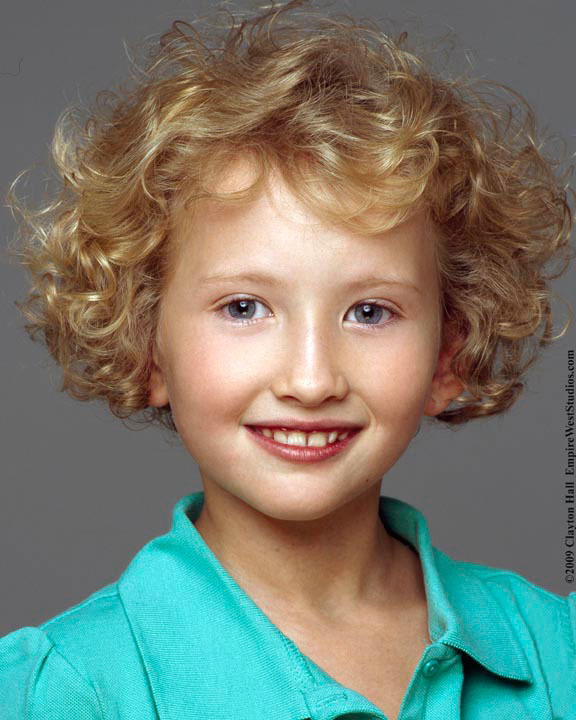 In what is considered an extremely short period of time by Hollywood standards, the exceptionally talented child actor Molly Joy Israel, 9, whom Empire West Studios (EWS) has dubbed “The New Shirley Temple,” has broken through with her first booking with Coast to Coast Talent…a commercial for The University of Phoenix. Her Dad, Rob Israel, who moved Molly along with her brother and Mom to the LA area to make it easier for Molly to get to auditions, e-mailed me today with the good news. Normally even for a child with star quality it can take much longer to get a break depending on suitable roles, the talent’s availability, the tenacity of her agent and personal manager, her acting ability, her look and perhaps most importantly…if she’s a pleasure to work with. But Molly, who has all of the above, achieved success in record time. She attends school during the week and handles about 4-6 auditions on average Monday through Friday. On Saturdays she studies acting with coach John D’Aquino who also runs Camp Hollywood which Molly has been invited to attend this summer. Her personal manager at Go Talent is very pleased with Molly’s progress as well as her popularity with all the casting directors she’s met and is currently grooming her for TV/Film. Way to go Molly!!! Keep up the great work. 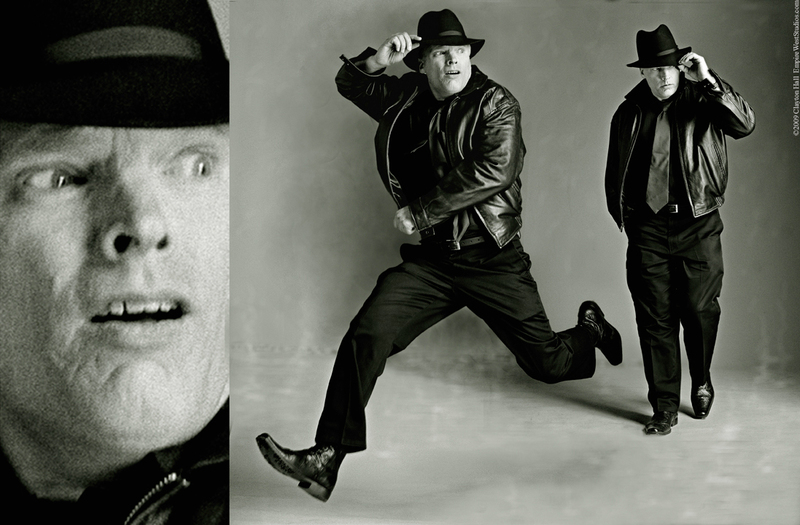 This amazing Roaring Twenties montage entitled “The Show Must Go On” was performed by Molly and photographed for her portfolio at Empire West Studios. Dancers must be styled properly to allow for freedom of movement. Everything…from Molly’s 20’s outfit to her dancing tights to her hoofer’s shoes…was thought out prior to her shoot. The Grizzly Bear in the second image and The Charleston were taught to her on the spot. The rest was all Molly. Closer to home, kudos go out to EWS teen model & talent, Justice Haque, 14, who was recently signed by the Ford Robert Black Agency in Scottsdale, AZ. All the details aren’t in yet but Justice, who has been studying acting with one of our top acting coaches and wants to specialize in comedy, is quite the fetching ingenue and obviously had the right combination of great photos, talent and good looks that hit the funny bone of FRB in exactly the right place. Congratulations on your success Justice. However, it’s not really a surprise to us because as we all know that Justice prevails. At only 14, Justice already shows her grace and beauty in front of the camera in this glamorous headshot. This quirky little twin set perfectly captures Justice’s sense of humor and makes a great image to promote her stand-up comedy act. chose a serious in-character performance image to associate with a subject like war in the Pacific doesn’t it make sense that if a casting director was selecting talent for a dramatic part that it would make their job a lot easier if they were looking at in-character imagery that matched that particular role instead of a commercial smiling shot? You bet it would! Match your photo to the role and your chances of success will skyrocket compared to your competition who just send in their smiling commercial shots for everything. Of course, the image doesn’t have to be a perfect match for the part but it should be a simiar mood and in-character showing your talent. We call these type of pictures that are in-character and show various moods niche shots and you should have a wide variety in your portfolio to choose from depending on your acting goals. And not just all headshots either. Half shots, like the Hanks cover, three quarter shots and even full lengths can show additional expression as well as your body in action. Empire West Studios’ clients have won model & talent conventions and procured top agents with our performance based full length photos! In short, you have to stand out from your competition…that’s Marketing 101, folks. Remember, commercial headshots are real people smiling and are for just that…TV COMMERCIALS. Even other upbeat projects like romantic comedies could be smiling but even a little more charactery than a commercial shot. Hope this gives you some great ideas. So stay tuned to the EWS Blog for a lot more great tips regarding Model & Talent Photography. 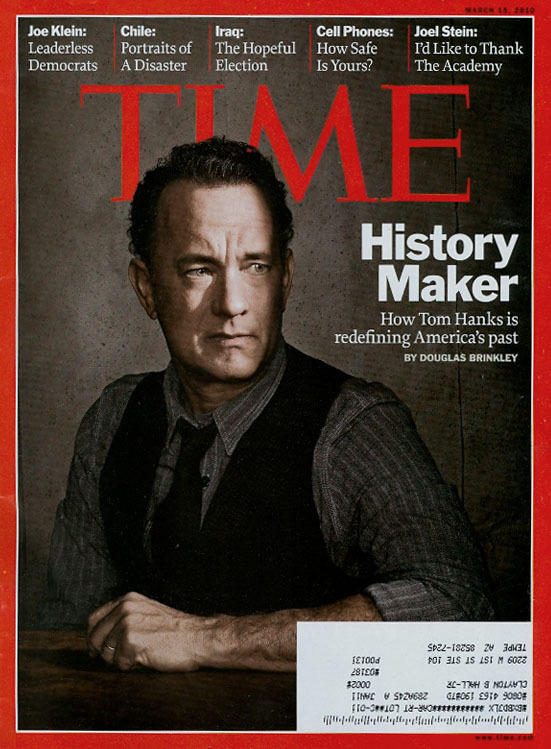 And don’t forget to check out Tom Hanks in Time Magazine and be sure to brush up on your history with The Pacific starting on March 14 at 9 PM only on HBO. 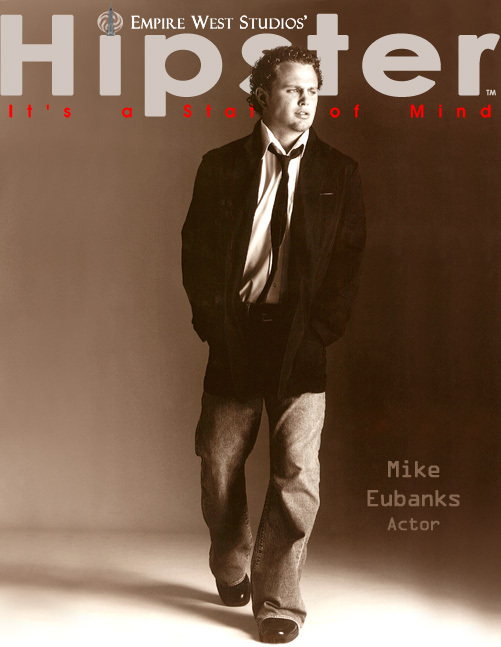 Mike Eubanks was in a number of Hollywood productions such as CSI and Unscripted on HBO and was with The Acme Agency in LA. Richard Wells, an experienced Shakespearean actor, recently signed with Signature in Phoenix with the help of this dramatic twin set. The close-up image on the left is actually the face detail from the full length in the middle. Hunter Slade Olson (13) and Molly Joy Israel (8), both Empire West Studios (EWS) clients, were recently signed by the children/teen divisions of two of Hollywood’s top model and talent agencies: AEF Talent and Coast to Coast. Both Hunter and Molly took part in well known model conventions and were noted for their standout performances and for their action-packed model & talent portfolios. Hunter attended THE’s convention in Stamford, CT while Molly took part in the IPOP convention held in Century City, CA. Both received an unprecedented number of callbacks from agency representatives at the events. Hunter, with 13 choices, chose AEF and Molly with over 16 went with Coast to Coast as her agent and chose Go Talent for personal management. The two kids were signed for TV/Film as well as for Print and are currently in Hollywood studying acting, casting for commercials and making the rounds during TV Pilot Season. Both Hunter and Molly won accolades for their pictures at the convention level and from their new agencies. Molly’s dad, Rob, commented that at the IPOP convention no one had any pictures remotely close. As a matter of fact, Molly’s agents loved her full length action shots so much they chose the full length shots as the featured imagery for her zed card and to start off her portfolio book. This is a first for actors, folks! So much for the commentary… “All you need is a headshot.” If you want to get noticed and stand out from everyone else you need to show something different…it’s called Performance Photography and that’s what we do at Empire West Studios. All the very best of luck to both Hunter and Molly. They are both two amazing talents.